The latest paper based on Alan Walks Wales data has been published in Interacting with Computers at Oxford University Press. 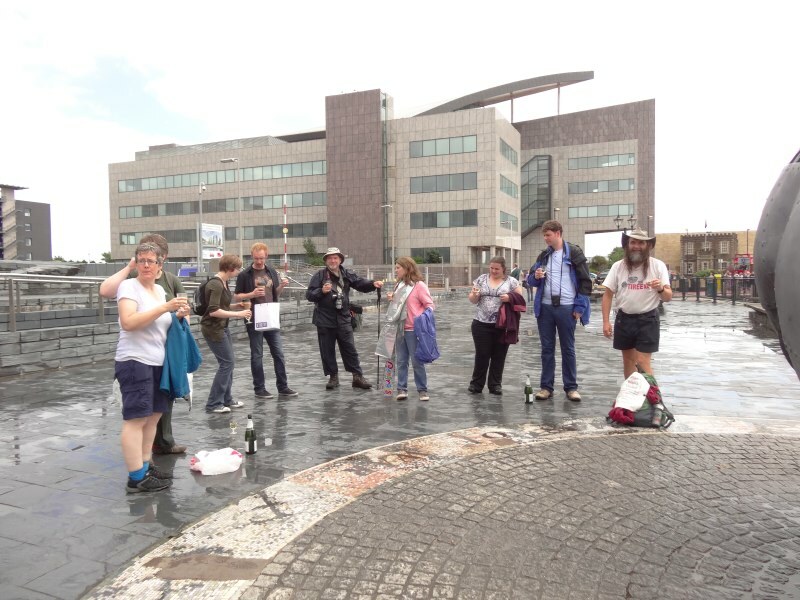 The paper Walking: A Grounded Theory of Social Engagement and Experience is based principally on Stavros Asimakopoulos’ grounded theory analysis of theAlan Walks Wales blogs and is focused on the emerging themes about social engagement and social navigation. Grounded theory is an analysis technique with roots in the social sciences, and Stavros has used it for many years to study domains from university web sites to sales forecasting, and, in this case, me walking! 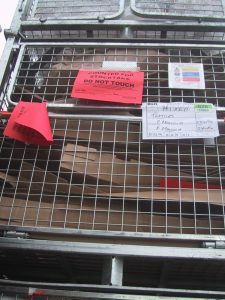 Grounded theory tries to start by assuming nothing, taking the data (in this case my blogs) at face value, building concepts from them, and then organising them into overarching theoretical themes. Stavros’ analysis found the following high level themes: accuracy of social judgements, need for decision accountability, enhancing self-esteem and satisfaction of intrinsic motivation goals. All were related to social engagement. The thing that was initially most surprising for me was that social engagement came out so strongly given the majority of the time I was alone, indeed some days I only met two or three people during the whole day. However, the blogs told a different story. When I wrote these social interactions took up a disproportionate amount of words: in strict time terms I was usually alone, and yet as I recalled each day social contacts took up much of my memoirs. Having realised this I then did an exercise thinking of all the people who were in some way connected to the walk. My initial list that I shared with Stavros had 23 different kinds of people from people I knew before the walk, but in some way supported or interested, to those I met on the way or was introduced to because I was walking. 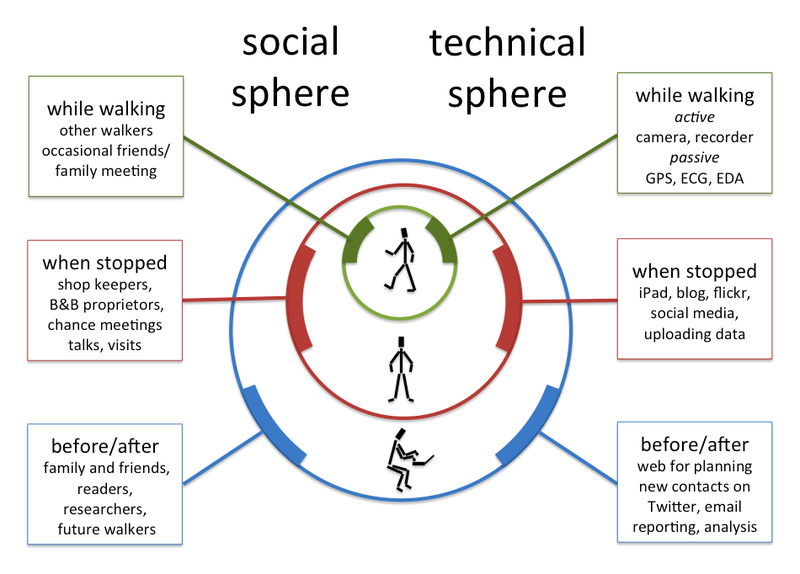 As we analysed these 23 groups using a combination of Stavro’s third-person looking in at the blogs and my first-person experience, we came up with various categories and ways of looking at the various forms of social encounter. One of my favourites is the coining of the term tribocentrc (from Greek ‘tribos’ for path) – people of the way. The paper also crystallised ideas of an onion skin model of experience that had begin with previous analysis of technology use. Just like social interaction, my instant impression of technology use whilst walking was I didn’t really use it much. However, also like social interaction, this was only if you look at the time I was actually walking, when really all I used was my camera, voice recorder and things that were passively tracking or monitoring me. However, if you zoom out to the day as a whole, or the whole project of the walk with its planning, reporting (such as this blog! ), then both technology and social interaction were woven through it all. A couple of weeks ago I was in Blacksburg, Virginia for a workshop called “Technology on the Trail“. CHCI, the Centre for Human Computer Interaction at Virginia Tech have an initiative of the same name and this workshop brought together academics and students at Virginia Tech. who have been working on the topic and four guest speakers from further afield including myself. 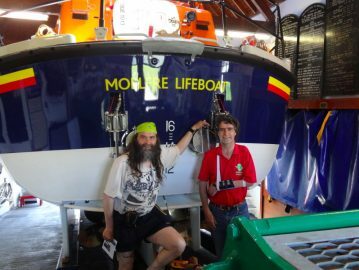 Scott McCrickard was the organiser, but many others at VT led sessions, organised parts of the event or took part. I was, of course, talking about the Wales walk, “Getting nowhere slowly: learning from a thousand miles at walking pace“, with a special slant on the tension between academic analysis of different themes and issues, and retaining a sense of the overall experience. Amongst the other guests was Ellie Harmon. 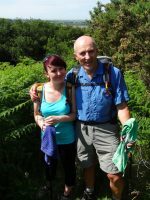 I was particularly excited to meet Ellie as she had been walking the Pacific Crest Trail at the same time as I was walking round Wales. Some years earlier she had also walked the Appalachian Trail. Her PCT walk was part of her PhD, which was an ethnographic study of the use of technology by long-distance walkers on the trail. I was particularly fascinated by the differences between the US long distance trails which are both substantially longer than the round Wales path (AT 2000 miles, PCT 2600 miles, compared to just over 1000 miles for Wales Coast Path + Offa’s Dyke), and also far wilder, with often several days between road crossings, and then some way down these to towns for resupply. However, they do seem far better way marked and constructed than large swathes of the WCP! The third guest was Allison Druin, who I know from her work on co-design with children, but is currently part way through a two-year secondment to the US National Park Service as Special Advisor for National Digital Strategy. She has been applying similar co-design practices to the entire NPS! The NPS is not just responsible for the large ‘wild’ National Park’s themselves, but also swathes of land in cities, including the Lincoln Memorial. She described the way every national park has its own app, and her efforts to ensure that there are common platforms as well as more engaging experiences on them. The final guest was Norman Su, who I’d not met before. He is at Indiana University, but is originally a city boy. His work from his PhD on has been on subcultures, so in Indiana he decided to look at hunters including learning to hunt himself, typically alongside children who were at a similar novice level. The hunters often feel quite culturally alienated by those from urban areas who find shooting game distasteful (albeit often happily digging into an intensively farmed steak). However, there are multiple sub-cultures within hunting itself, often defined by the technology they use, from those who use the most advanced weapons available, to those who use simple bow and arrow, or muzzle loading rifles. A key feature that emerged from his analysis is the idea of rules of a ‘fair chase’: pitting the skill of the hunter not just the raw technology against the animal, and also ensuring that any kill is a clean kill: one bullet — one carcass. As well as talks by the guests, we had a number of workshop activity sessions including a role play taking a walk to the university duck pond as if it were a hike, and various design/brainstorming sessions looking at the synergies and conflicts between different stakeholders and potential technologies for use on the trail. My chosen technology would be a small device with physical buttons (not touch screen!) and GPS, possibly integrated into a voice recorder. The buttons could be colour coded and allow you to simply tag a spot from a small pre-determined set (bad path, view, etc.) and perhaps leave a voice note. Later one can go back and add details, but while walking I’d like to just say “this is an interesting spot”, and move on. One evening there was a small reception where students showed some of the projects they had been doing around the theme. This included cultural probes, text analysis of tweets about various long distance trails in comparison with their mission statements and a touch screen system to explore Ellis and my blogs about our walks. 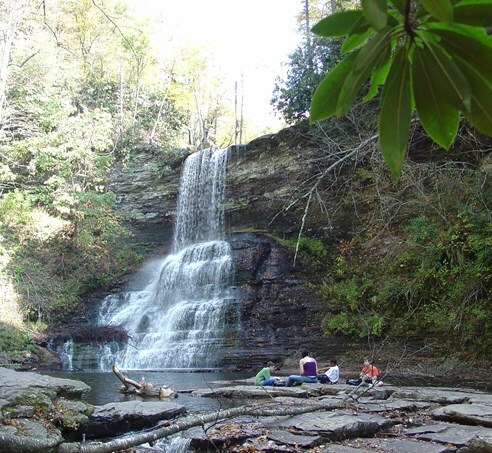 The workshop concluded with a short walk to he t66 foot Cascades waterfall, where the white foam of the falls was beautifully framed by white ice sheets across the rock face. The photo below from virginia.org is clearly at a warmer time of year! There were so many conversations from things highly germane to the trail, to those more peripheral: Blacksburg’s single-screen, volunteer-run cinema’s Oscar nominee series, the nature of the Red Neck, the American Independence and Civil Wars (in the South, not utterly forgotten), and campaigning in the area at the last presidential election. Of course the latter things are not utterly independent of the workshop topic, as urban ideas of nature as object of preservation and leisure can often stand in conflict to more pragmatic rural connections to the land. Aside from politics, there were two things I found myself mentioning repeatedly. 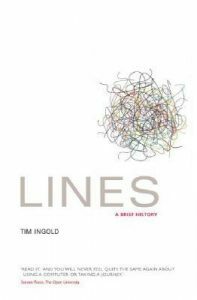 The first is Tim Ingold’s book Lines: A Brief History . Ingold’s thesis is that we have privileged the point or place in modern thought, seeing the connection as merely the means of getting from A to B. Ingold is an anthropologist and spent time studying reindeer herders. Their way of life is to follow the herds as they make seasonal migrations; for the tribes following the herds it is the way they follow, the path, the line, which is primary. Ingold has also edited a collection, Ways of Walking. 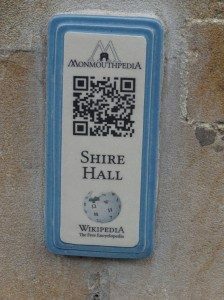 Monmouth is a small county town on the border between Wales and England, but in 2012 it became “the world’s first Wikipedia town”. I am amazed at how few people in academia have heard of the project, indeed I probably would not have myself if it were not for the walk. MonmouthpediA was a joint project between WikiMedia and various local councils and agencies, which included creating a special area on Wikipedia with entries for pretty much every building ad location in the town, free WiFi over parts of Monmouth, and, most significantly, small plaques with QR codes everywhere in the town linking to their MonmouthpediA pages. With the benefit of hindsight I think it would have been better if they had used an intermediary URL, rather like tinyurl, this would have the made it easier to remap codes to content, including, for logged in users, contextually (e.g. 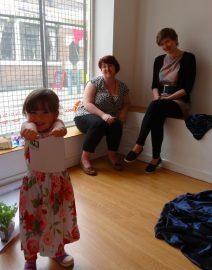 children’s content, treasure hunts). However, for it’s time it is truly innovative and I’ve not heard of anything similar elsewhere since. As far as I know there is not yet a world’s first Wikipedia trail! Reflecting on the various presentations, group workshop discussions and informal talks during the visit, a number of themes emerged for me. Part of the Wales Coast Path publicity was that it was “Way Marked”, hence as a rule (see also below) of my walking I followed these first and only consulted the route on a map (another marking) when I got lost from the markers. Several more experienced walkers I met on the way had walked US trails, or Camino de Santiago in Spain remarked (sic) on the different quality of marking. Things Ellie said and discussions during the Saturday Cascades walk, emphasised different natures of the laid out, or beaten path on the ground. 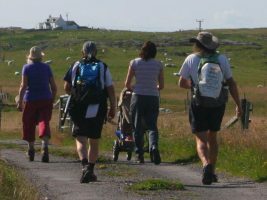 In the UK some long distance paths are waymarked, others deliberately not – you need to navigate to follow them … virtual paths. On Saturday Scott drove us “across the state line” (a phrase repeated so often in films) into West Virginia … a virtual line on the map, but also the road visible changed it’s character. 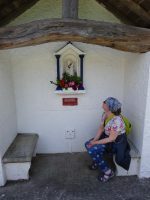 We chatted on the walk about crossing the Equator and Arctic Circle – virtual lines, but ones with some physical identity, and the Greenwich Meridian, a purely arbitrary human line, but in Greenwich marked in the pavement. 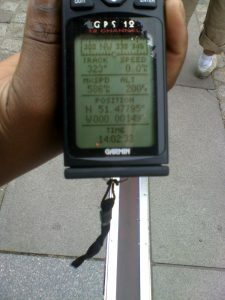 The photo shows the Greenwich Meridian – marked on the ground and measured virtually with a GPS. However, the two differ as UK longitude-latitude is slightly different from GPS long-lat indeed about 100 yards different at Greenwich … measuring where you are on a curvy earth is not straightforward. The latter connects to a chapter I’ve been recently writing about the ways physical and digital (or read more generally imaginary/virtual) worlds are connected (QR codes, etc.). One thing I noted early while walking was the importance of cues to tell you when you are not on the path. This also has parallels in information systems design – error detection is as important as error recovery, indeed arguably more important as you cannot recover if you don’t know you have gone wrong … lots of links here to undo and things. Ellie mentioned the frequent white blazes on the trees on the Appalachian Trail, and so, when she accidentally went off trail, she noticed quite quickly because there were no white blazes on the trees. Note that this relied on the reliability of the waymarks, so that their absence was actually a sign in itself (rather like silence in speech). The lack of this reliability was, in contrast, a major problem on WCP, where they only seem to mark the ‘significant’ points (e.g. where the path exited a large open space), and, in some areas, even these erratically! One reason the WCP markers were so small was, I think, so that they did not ‘mess up’ the countryside. 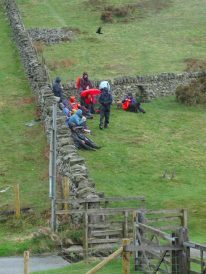 Indeed, while I was walking, the Chair of the Long Distance Walkers Association, wrote a letter to members decrying the fact that on a couple of long distance paths, there had been incidents where someone had painted arrows on rocks to help guide walkers. 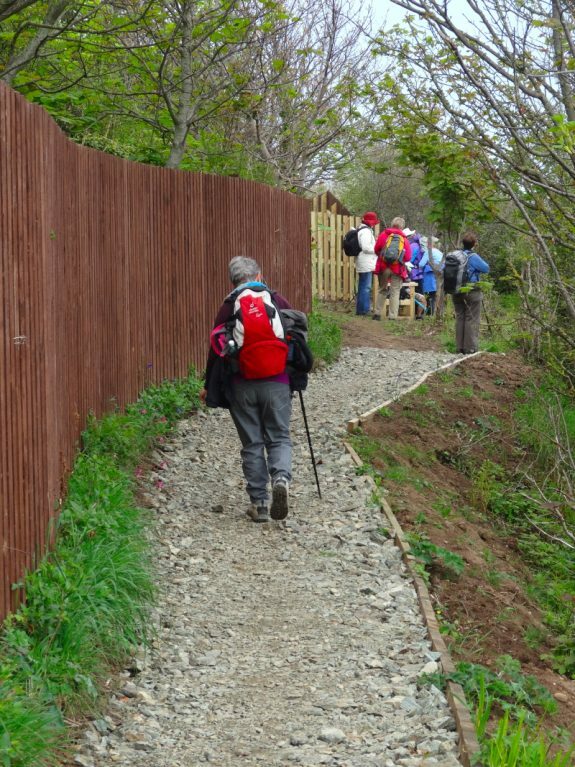 As well as being criminal damage (remembering that there is little truly public land in the UK, only private land with rights of way), it also gave walkers a bad name. Although this was all perfectly correct, it was a point I pondered often as I struggled to find a 3 inch roundel across the far side of a field in the dusk or rain. 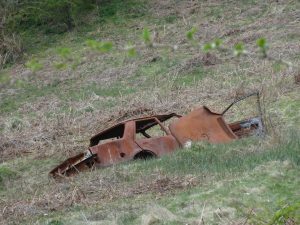 The countryside is often far from ‘tidy’, full of fragments of baler plastic, discarded farm machinery, just about anything turned into feeders and water containers, and yet many in Britain have an image of the unspoilt rural idyll. There are also good reasons for hiddenness. When the WCP crossed through built up areas roundels were attached to existing sign posts, but were rightly small as they are not relevant for the majority of people using the place (see meta-semiotics and Stanstead below). Indeed in some places, the normal 3 inch roundels, were reduced to small one inch ceramic disks and embedded into the pavement, very hard to spot even when you know they were there, but deliberately to be overlooked by those for whom they were not relevant … and also hard to vandalise. I’m reminded too of Gypsy patrins (or patterans) and Hobo signs, which showed whether a house was a good one to beg at, or where other members of your group had gone, but were simple arrangements of stones or sticks that others would miss. The open WiFi chalk marks that sprung up in the late 1990s / early 2000s a similar example. Norman’s hunters’ ideas of fair chase meant they created their own sets of rules about what was, or was not reasonable hunting practice. Ellie mentioned how some thru-hikers would not take a short cut when the path meandered up a mountain, or take alternative more scenic routes. I also had internal rules about conditions when I felt it OK to deviate from the set path: when I could get closer to the sea, or when I had got lost and it was ‘their’ fault (as in the WCP developers). 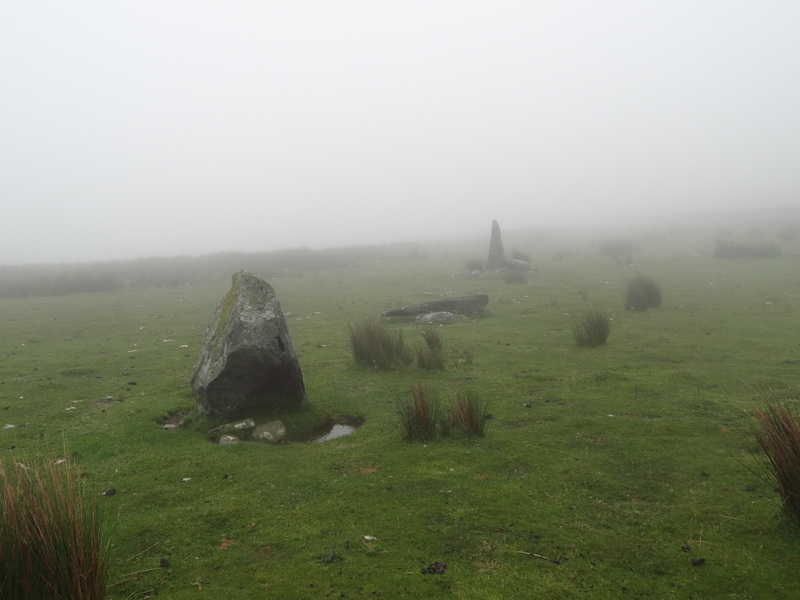 Rather like the marks for the path, information may be embedded in the land (e.g. the information board on the Saturday walk that told us about the old logging engine), or linked to it and presented elsewhere (guidebooks). There are of course, digital versions of both these: public displays in location and smartphone apps, etc. linking from elsewhere. Interestingly one of the distinctions for this is whether the points of linkage are physically inscribed in the land (e.g. QR codes for MonmouthpediA) or external to it (e.g. the PCT Halfmile waypoints). In a project about ‘non-places’ (French philosopher Auge’s term), we had a meeting at Stanstead airport, and I became fascinated by the way signage sort of told you whether to there to read it or not, the meta-semiotics, of how to read a sign, who was intended to read it or not (see “not for itself: insider/outsider orientation of place and signage and systolic flows” ). Another issue I first really became aware of in the non-places project, is about different flows human and material (I still have the photos of the back of a DIY store where we had another meeting). As human flows are in space and time, for unconstrained 2D movements, you may never encounter those whose paths cross yours, but linear trails change this relationship. Passing people going the same way as you are, walking with them for a while, meeting people going the opposite direction, and those who live on the way (shop keepers, campsite owners, park rangers). There are also people who have walked the way before: flows along the same path, but at different times, leaving marks in the wear of feet, log books, guides, and even major motion pictures. This connects to another theme in my past work ‘absent presence’ the ways to be aware of others at the same place but different times. One of the questions asked by a working group was “what are people”, and indeed we later had a workshop session focused laregely on identifying different stakeholder groups with interests about trails. Egocentric/ people of life – These are the walker’s own individual community, linked to his personal existence. They are stable and long-standing, and largely geographically stationary but widely distributed. 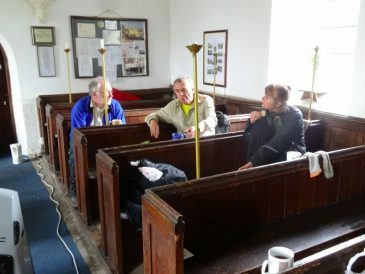 Geocentric/ people of the land – These are the local community, people who live in the towns and places along the way. They are linked to a specific place. The relationships are typically fleeting, but the people themselves are largely geographically stationary and localized to the route of the path. I have written quite a lot about the use of local maps that emphasise the identity of an individual or of a place. However, there are also incredibly creative uses of maps that are more in the Cartesian tradition, combining geospatial data and digital mapping to creative visualisations that may be informative, subversive, beautiful and, at their best, all three at once. As part of her master’s studies Margarida Fonseca has created Flowing City, a stunning collection of visualisations of urban data1. From routes of Beijing cabbies, to galvanic skin response in Greenwich, and social network language in Milan, the examples Margarida has collected show the amazing ways different projects and individuals are remixing their own data, or publicly available data in order to make the often unseen patterns around us visible. Many of the projects are by university research groups, but I’m also aware of many basic, but often transformative uses of data by simply mixing open data with Google maps or other similar technologies. I’m wondering what it would be like if visualisations such as those found in Flowing City could be in the hands of every community group, urban or rural: campaigning for better transport, understanding education needs, preparing for floods. But while pondering that I have downloaded a copy of Margarida’s thesis. So, just browse the Flowing City site, compare with the Maps in Textiles I posted about a week ago: art and technology, the Cartesian and the idiosyncratic, may be not so far apart. Although this is a WordPress blog, the bookshelf section I added last week is generated from a Workflowy list that Fiona created. Now Workflowy is a collaborative list-making web application, not a CMS or database, and yet effectively we are using it as exactly that. With a gathering library of both existing books relevant to the walk and new presents at Christmas, I had been meaning for some time to share them on-line; not difficult, just needing time to collate details, scan covers, etc.. So, a few weeks ago I gathered together a pile of books, and then Fiona went through them scanning the covers and typing up details. We had been using Workflowy to share a to-do list for the walk as Fiona has become a great Workflowy fan1. 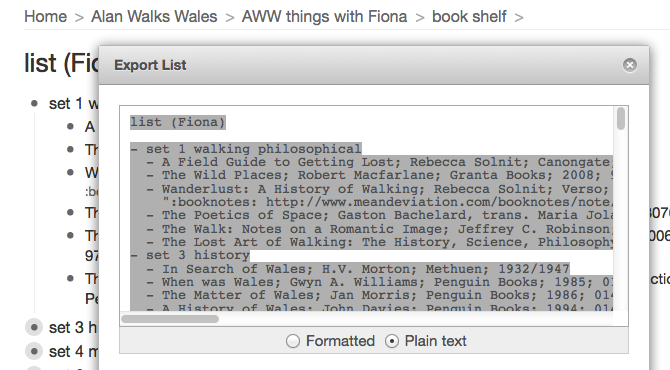 It was quite natural therefore for Fiona to simply type the book details into the shared Workflowy list as sub-items under the ‘list’ task. However, I realised that once the information had been copied into a web page if there were new books or edits, then either Fiona would have to do everything new straight into the web page, or try to keep her list and the web page in sync by hand. Perhaps we could use a more dedicated bibliographic tool such as Mendeley, Zotero or LibraryThing, but why use another interface when Fiona was already using one she was clearly comfortable with? So, no new interface, no re-editing of data into a different system, no keeping web page and list views consistent by hand, instead the relevant portion of the Workflowy list is exported, copied into a Dropbox text file and then a web-based processor picks up the data from the Dropbox file and transforms it live into the bookshelf web page on this site. Fiona only ever edits the list and has to do the initial copying into the Dropbox file, and then everything else is automatic. In fact one of the research agendas I have during the walk is data integration; trying wherever possible to link together existing data sources, or where I am creating new data or new applications, to make them linkable, reusable, etc. I have noted with interest existing applications that follow these principles, for example, Social Hiking for linking together social media as a record of expeditions, and PlaceBooks that allow the collection of different sources to make mini mobile guides to areas. I am also interested in the use of semi-structured data, using data the ways people naturally enter it rather than force them to use some sort of standard format. For example, the HCI Book 3rd edition site is generated by using hidden web pages edited using Dreamweaver templates, but then stripping the data back out of those templates to be remixed in different ways on the site (e.g. showing exercises collected in a section of their own, but also under each chapter). In the last few years I’ve also looked at extracting structured data from CSV and spreadsheet files and point and click ways to create semantic ‘screen scrapers’ for web pages. Indeed the BookNotes mini-app that I will be using to share book reviews and personal page-by-page notes is also based on lightly annotated plain text files placed in Dropbox2. Traditionally computing has created interfaces and asked people to use them, effectively adapting themselves to the system. User-centred design tries to ensure that these interfaces are designed around the users’ understanding and often based on their existing work practices. Where there is semi-structured data already, we have the ultimate end-point of this, to simply use the existing formats that people have evolved for themselves and let the computer do the work to transform them into formats useful for automatic processing. So, this was an opportunity to practice what I preach (! ), if Fiona chose to put data into Workflowy, than that should be the ‘golden data’ and everything else flow from that. So … a couple of hundred lines of code later, it works! There was one small change to the raw data format to make it parsable: Fiona had used commas to separate title, author, publisher, etc., perfectly human readable, but some titles and publishers had commas in them, so this was changed to ‘;’. Also ‘blank’ fields were denoted by using ‘;;’ Otherwise everything was parsed exactly as Fiona had originally entered it, giving the page as it appears now. If more books are added, or edits made, all that is needed is to re-export the list to the Dropbox file and everything else is automatic. Workflow allows lists to be exported either as formatted HTML or plain text. The plain text format was sufficient, and this is pasted into the shared Dropbox file. A share URL can be obtained for the file and this is used to configure the first stage. This is then parsed (approx 100 lines of code) to generate an internal data structure, shown below formatted as JSON. Stage 1 is completely generic, books and sections are just items. The next stage further parses this to create lists of books. The presence of ‘children’ (sub-items) is used to decide the difference between a section and a book, and then the title line of each book entry is split on the semi-colons. There is a little tidying of the title for items with ‘(DVD)’ (i.e. media is not a book!) and to split the main title from subtitles (before and after the first ‘:’, ‘-‘ or ‘(‘), and a ‘slug’ is obtained from the main title to match with the image file names. There are a few extra elements. If a 13 digit ISBN is provided an equivalent 10 character form is created where it exists; this is in order to be able to generate Amazon links. Wonderful romp of a book … although at 1 mile an hour in the early stages, not necessarily a physical romp! A plain speaking northern lass, sets out on the South West Path, never intending to travel the whole way round – makes me feel well planned. 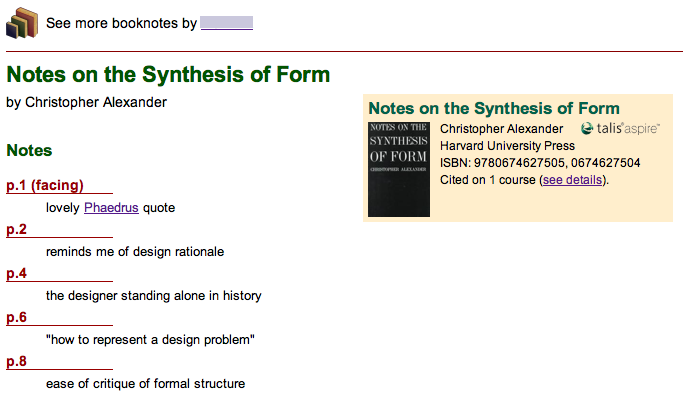 Note as well as the text of the note the extra tag with the url of my BookNotes for the book. It probably didn’t take longer to code this up than it would have to copy the data into a web page and edit it, but even if it did take a little longer3, now I know that the book list data can be manipulated any way I like 🙂 In addition, the first stage will work if there are any other kinds of information that fits nicely into Workflowy’s hierarchical structure; I am sure we will reuse it. And the Workflowy folk say that an API will happen sometime, so maybe everything will be a list! But of course I’m already looking at the stage 2 and 3 code and thinking, that is basically JSON transformation and formatting, surely that could be made more declarative and generic, maybe the whole pipeline could be made reusable as a tool.